It’s never too soon to learn about the Big C. Disney Junior’s Peabody Award–winning animated hit Doc McStuffins will push the boundaries of preschool programming on June 4 with an episode themed around cancer. It’s not the first time this progressive series—about an African-American girl who wants to become a doctor and practices on her toys—has gone to bold places. Past topics include the importance of blood donations, difficulty adjusting to a new sibling and the emotions little ones face when a military parent is deployed. But this story, airing on National Cancer Survivors Day, is something else altogether. “Many kids watching us have chronic diseases—things that can’t be cured with a kiss and a cuddle—so we created a story specifically for them,” says creator and executive producer Chris Nee. “We wanted an episode that says, ‘We see you.’” The plot centers on a spirited tyke named Audrey, who has lost her hair due to aggressive chemo treatments, and her rag doll, Hannah, who must also get her head shaved because her hair has been ruined by a blob of impossibly sticky gum. 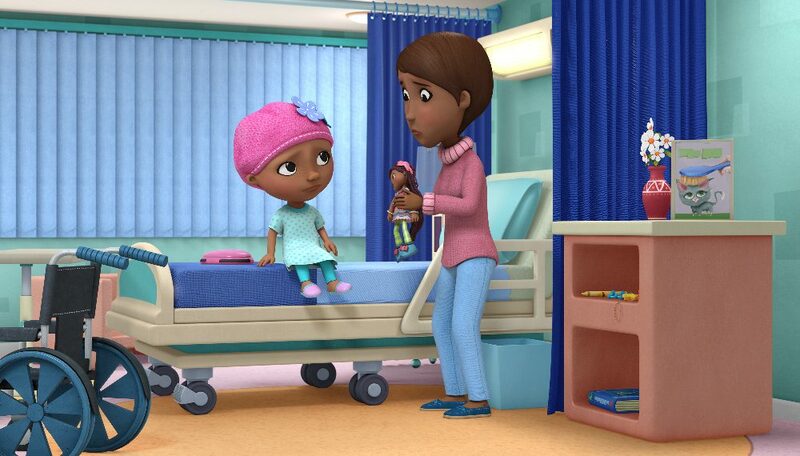 Audrey’s mom is voiced by real-life cancer survivor Robin Roberts of Good Morning America. The McStuffins family is growing as part of a monthlong story teaching kids about grown-up topics. In the meantime, she’ll have to settle for the undead. Nee’s next Disney Junior series, Vampirina, coming this fall, is about a family of vampires who move from Transylvania to Pennsylvania.